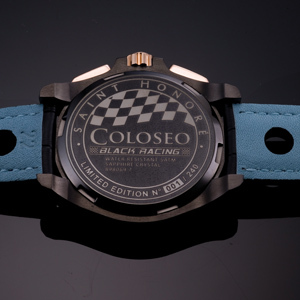 The Coloseo Black Racing 2010 is the latest addition to the Black Racing series and will get its first taste of the track on the wrists of the best drivers in the world at the 2010 Le Mans 24 Hours. 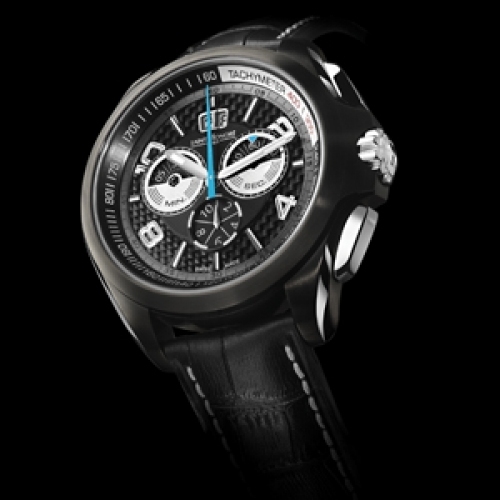 Saint Honore ambassador Paul Belmondo helped launch this prestigious limited series in 2006, a collection inspired by the world’s most celebrated automobile races. 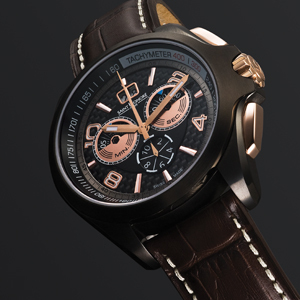 The class of 2010 echoes the inimitable style developed in the earlier editions, particularly the stunning black case, but adds a graduated tachymetric scale from 0 to 400 km/h around the dial’s circumference. Other features include a carbon dial, oversized numerals that make it supremely easy to read, a top-stitched leather strap, an engraved Black Racing back with exclusive logo, and blue hands. But the greatest innovation on this timekeeping masterpiece is the new approach to telling time with the disc chronograph: the counters at 2 o’clock and 10 o’clock were specifically envisioned and designed to resemble a race car dashboard.